Hot on the heels of the recent Power BI service and mobile update in Q3 this year, the Microsite team has rolled out new AI capabilities in Power BI. Power BI makes it possible for all your employees to make better decisions based on data with beautiful reports and dashboards. And having worked with Microsoft for over two decades – and with Microsoft Power BI since its launch – the Influential Software team is always keen to share the latest features. This time, Microsoft has made a great leap forward with new AI capabilities in Power BI. But first, why do we need AI in Power BI? With the massive volumes of data generated today about every aspect of a business, finding insights from the data can be challenging. This is where AI can help. AI can aid in data exploration, comb through the data to automatically find patterns, help users understand what the data means, and predict future outcomes to help business drive results. There are huge opportunities when workers across an organisation can leverage AI for improving business outcomes. But data scientists, who are crucial to deploying AI solutions, don’t have the bandwidth to provide custom solutions to all users at an organisation. Businesses need ways to surface the valuable work of data scientists and empower more users to leverage AI in easy and intuitive ways. Microsoft is taking a major step forward in bringing AI to business intelligence and announcing several new AI capabilities in Power BI. All these new AI capabilities in Power BI – pioneered in Azure – require no code. This enables all Power BI users to discover hidden, actionable insights in their data and drive better business outcomes with easy-to-use AI. Curious about what we can achieve for your business with Power BI? Azure Cognitive Services are sophisticated pre-trained machine learning models that can extract insights from data. Microsoft is bringing Azure Cognitive Service capabilities into Power BI to provide powerful ways to extract information from a variety of sources like documents, images, and social media feeds. These algorithms can identify named entities such as organisations, people, and locations. They can recognise objects in images, detect language, identify key phrases, and determine positive or negative sentiment. Imagine you’re a business analyst for a hotel chain and want to evaluate what guests are saying in their online reviews. 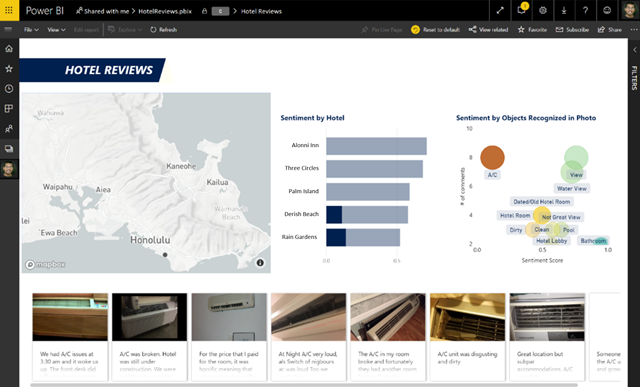 With Azure Cognitive Services in Power BI, you can easily analyse thousands of online reviews, understand what your guests are happy or unhappy about, and pinpoint areas of improvement. Every organisation has metrics or key performance indicators that measure business success. How do businesses determine what impacts those KPIs? What causes these KPIs to go up, down, or stay the same? The most obvious business drivers are typically easy to spot, but it doesn’t take long before things get complex. What drives business outcomes is often subtle and depends on any combination of circumstances. 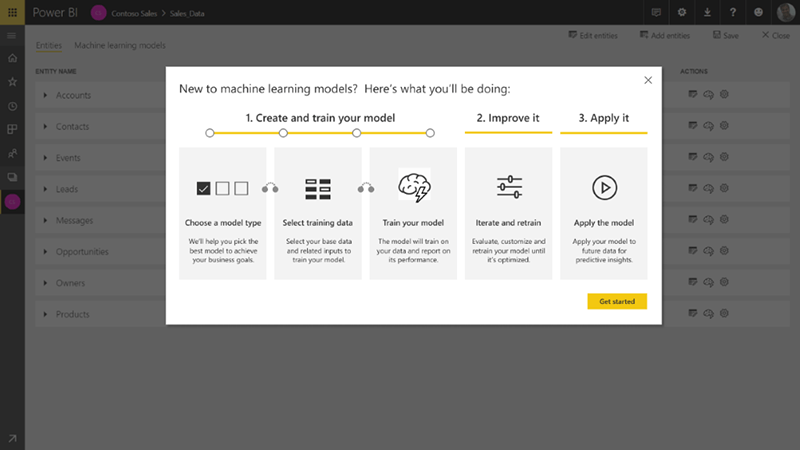 In Power BI, business analysts will now be able to build their own machine learning models without writing a single line of code. Microsoft is using the automated machine learning feature in Azure Machine Learning, but instead of targeting developers or data scientists, we’ve simplified it and made it broadly accessible for common use cases. This means that when an analyst builds a machine learning model in Power BI, it does all the heavy lifting by selecting the best algorithm and features with just a few clicks. As an example, a business analyst could leverage the automated machine learning technology to quickly and easily build a model to predict how likely an open sales opportunity is to be won. This could help a sales manager prioritise which high value opportunities to focus on and how likely they are to meet their target. Advanced machine learning requires specialised data science tools. Azure Machine Learning is a platform where data scientists develop machine learning models to take on complex business challenges. Azure ML models built by data scientists can now be easily shared with business analysts. Power BI works behind the scenes to discover the models to which each user has access and automatically creates a point and click user interface to invoke them. This makes collaboration among business analysts and data scientists easier and faster than ever before. Turn the complexities of business data to your advantage with your strategic BI partner – Influential Software. Whether you are looking at Power BI On-Premise or Power BI Cloud solutions the experienced Influential team offer complete Power BI Support and Services. Businesses across the UK, of all sectors and sizes, have benefited from our technical expertise and business experience. Leverage Power BI, one of the technologies that are already creating massive value for early adopters. This news has been adapted from online content by our partner, Microsoft.